Furry Flashback – How Many Dogs Do You Have?? A number of years ago, I was hanging out with a group of new friends. We had been talking for quite some time and, of course, I talked quite a bit about my dogs. Towards the end of the conversation, I mentioned that I had to go out of town for a business trip and was trying to decide what to do with “my boys” while I was gone. One of the guys in the group, John, spoke up and said he’d gladly dog sit for me. We arranged a time at a later date for him to meet the boys and make sure everyone would be comfortable with each other. John: Where are the other dogs? John: How many dogs do you have?? John: (laughing) Oh. You mentioned so many different names, I thought you had 10! It was my turn to be puzzled but then I realized… I called Niko and Rocky so many different names and had probably done so during the course of my conversations with John and other friends. Anyone who didn’t know my boys could easily be confuzzled. Heck, people who did know them were confused! 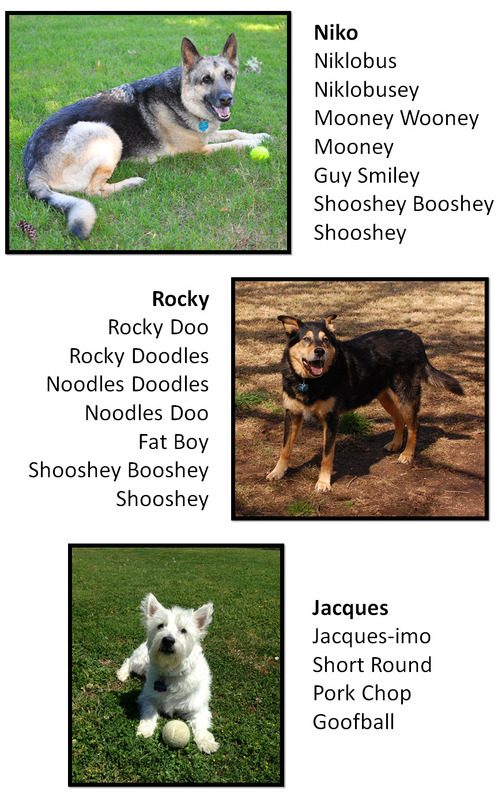 Though Niko and Rocky are gone, I still often refer to them by one of their many names. I have unintentionally carried on the tradition with Jacques. My husband has even given him a few nicknames – though I will not be repeating them. 🙂 Jacques is still relatively new to the family, so I’m sure his list of names will continue to grow. It’s Super Bowl weekend and that means we’ll be eating food that is terrible for us (but that tastes SO good! ), enjoying refreshing adult beverages, and watching the Puppy Bowl. And that’s before the Super Bowl actually begins! I have enjoyed the Puppy Bowl for many years. Seriously, how can you not?? My husband tolerates it because he likes to hear me giggle while watching the puppies play. (Yes, I realize how that makes me sound. I’m at peace with it.) I think this year will be a little more fun than years past because of Jacques’ new fascination with the TV and especially the laptop. I’m guaranteed to get two shows for the price of one. While the puppies are running and rasslin’ on TV, Jacques will be running, jumping, and whining through the house. I have a feeling he won’t be so hot on the Katty Furry halftime show (no offense to our feline friends), but you just never know. It’s going to be a day of fun entertainment and treats for everyone at our house. Whether you watch the Puppy Bowl, the Super Bowl, both, or nothing at all – we hope you have a great weekend! I felt like he was speaking to my heart. While Jacques might not be the sharpest tool in the shed, he is extremely loving, happy-go-lucky (except in the morning – he’s NOT a morning dog), and an absolute clown. He makes us laugh constantly. Even my husband agrees – Jacques is a good boy. We are very fortunate to have him in our lives. We truly love him. So this Jacques-uary, remember that love comes in all shapes and sizes (and often when you least expect it). Keep an open heart and open mind… You just never know what will happen. 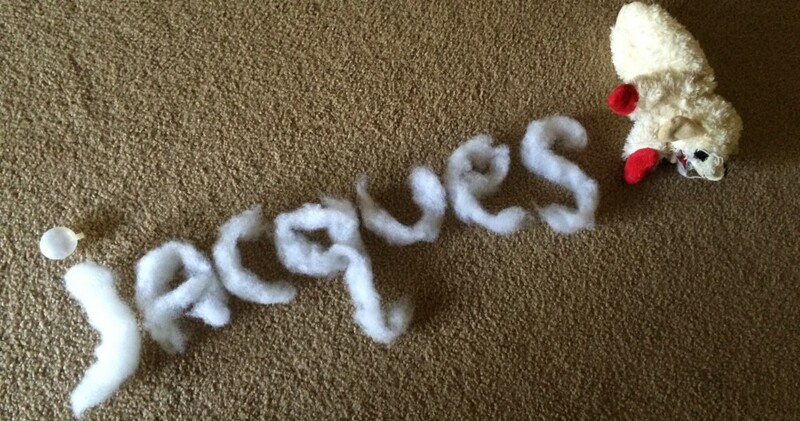 Also, we are celebrating our second year of Jacques’ Dog Blog. We would like to thank everyone for reading and following our blog! Happy Jacques-uary!! May your 2015 be filled with love, laughter, and happiness!! Jacques is an equal opportunity well-wisher kind of guy. Really it’s just that he likes to party and socialize. Don’t let him near the punch bowl – trust me on that one! Seriously, though… Whatever howliday you’re celebrating, we hope you have a safe and wonderful time! May your 2015 be filled with love, health, and happiness!! And remember… help those who cannot help themselves. Jacques was not harmed while taking these photos. However, if he could see them, I am sure he would be quite humiliated. Jacques never ceases to amaze me. Sometimes it’s his cuteness. Sometimes it’s his tenacity. Most of the time it’s his insanity. But one day last February when Rocky was still with us… He really came through for me. And for Rocky. I think about that day and even now am still amazed. Rocky’s foot was bloody from a cut caused by the icy snow, but he was able to limp towards the back door. Most of the way there he couldn’t put weight on his back foot, but by the time we made it inside he was able to walk. Thankfully he wound up being okay, just a little shaken up. Jacques followed us the whole time, barking his encouragement. (Okay, I don’t speak dog, so I have no idea what he was “saying,” but this is my story and I say he was barking encouragement, so that’s what we’re going with.) Had Rocky been out there much longer, he might not have been able to walk back to the house on his own. I’m not sure what I would have done, but I’m thankful I didn’t have to think about that. I was so proud of Jacques and so pleased (and surprised to be honest) that he was able to alert me that something was wrong. He got lots of extra treats, hugs, and kisses that night. And that was the time Jacques saved the day. I knocked on doors and tried to find anyone who recognized him. After quite some time walking in the cold, I decided to have my husband come pick me up (I’ve been quite under the weather and just couldn’t stay outside any longer). Before my husband to get to me, the pup had wandered up to a house and acted like it was very familiar to him, then he disappeared. We drove back a little later looking for him but didn’t see him. I hope he found his home. When I got home that night and was greeted by my dancing and barking Jacques, I got a little teary-eyed. I thought about that big yellow dog following everyone and couldn’t help but think about Jacques’s story. Jacques had followed some people who were out for a walk in the cold and the snow. He followed them to their home and sat on their doorstep looking into their warm house. I can’t imagine how scared and cold he was – but his luck was about to change. A wonderful person – Meghan – took him home with her. That night, Jacques was safe in a warm house and surrounded by love. Meghan took such good care of him. When she couldn’t locate his owners through phone calls or ads in the paper, she started looking for a forever home for him. And then my life changed forever. My husband and I joke about Jacques all the time, but at the end of the day we both say how lucky we are and how Jacques has turned out to be such a good boy. He really is. So, Meghan, thank you for being so kindhearted and for caring for Jacques. He was just what my heart needed. You, Jacques, and my wonderful husband are a few of the many things I’m thankful for today and every day. he gave me such fright. he kept me up all night! he’s hidden inside the wall! runaway mouse, go, scram, shoo! because I need my beauty sleep tonight.